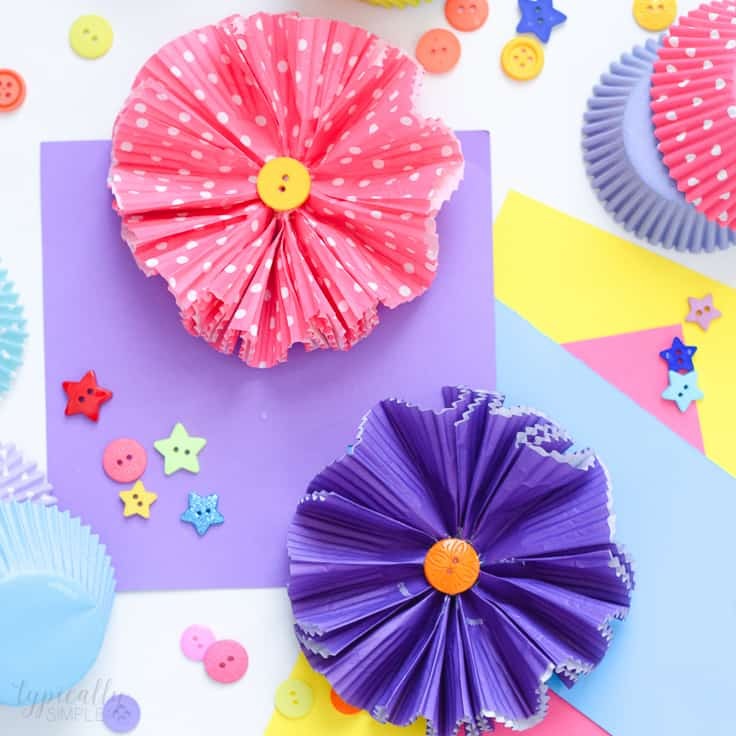 Make this cupcake liners flower craft to use for wreaths, centerpieces, banners, or even as a fun spring craft to make with the kids! Hi there, Kenarry readers! It’s Kelly from Typically Simple where I share kids’ crafts, printables, and learning activities that the whole family will enjoy doing together! I also love sharing simple crafts here on Kenarry like felt corner bookmarks and personalized flour sack towels. 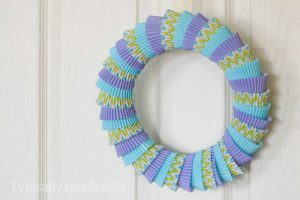 And this month, I am back with a craft that is not only fun and easy to make, but also works wonderfully as an embellishment for other crafts! A while back, I went a little overboard buying cupcake liners for another craft project. Since I wanted a variety of colors and patterns, I ended up with a few hundred cupcake liners. I store them in a big jar on display in my craft room, use them for baking, and try to think of craft projects that I can make with them, but I’ve barely made a dent in my stash. 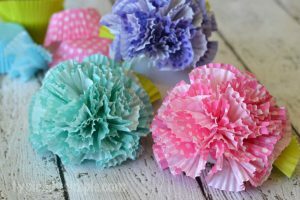 So I thought it would be fun to use them for this cupcake liners flower craft that is perfect for spring and summer! 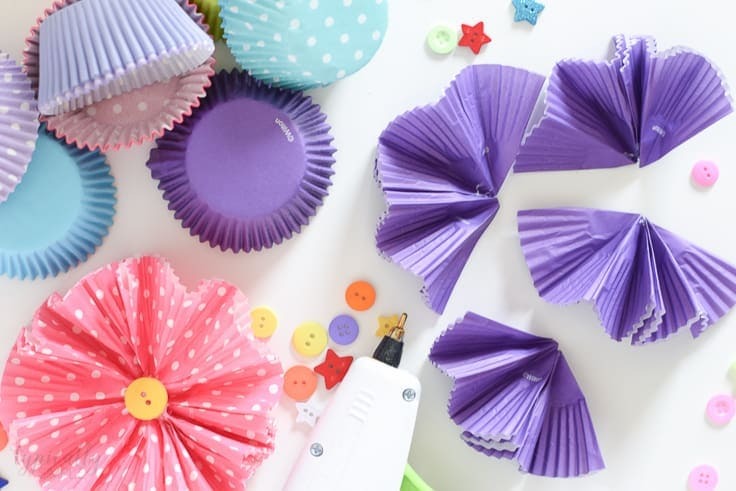 With all the patterns and colors of cupcake liners available, you can create a whole garden of flowers to use for decoration. Each flower uses eight cupcake liners. Fold each of the liners in half. Then fold the liner in half again. And finally fold each half back to create a “M” shape with the liner when laying on its side. Take two of the folded liners and glue the points together with a dab of glue. Continue to glue two liners together until you have four sets of two. Now glue each of the sets together to create a circle of liners. Add a dab of glue to a button and place in the center of the liners to create the flower. 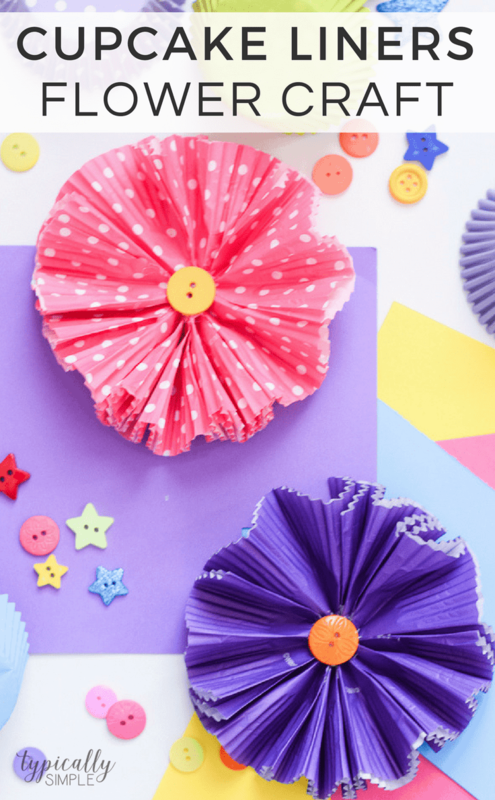 Fold, glue, repeat until you have a bouquet of cupcake liner flowers that are perfect to add to spring wreaths or to create centerpieces for Mother’s Day, Easter, or even birthdays! 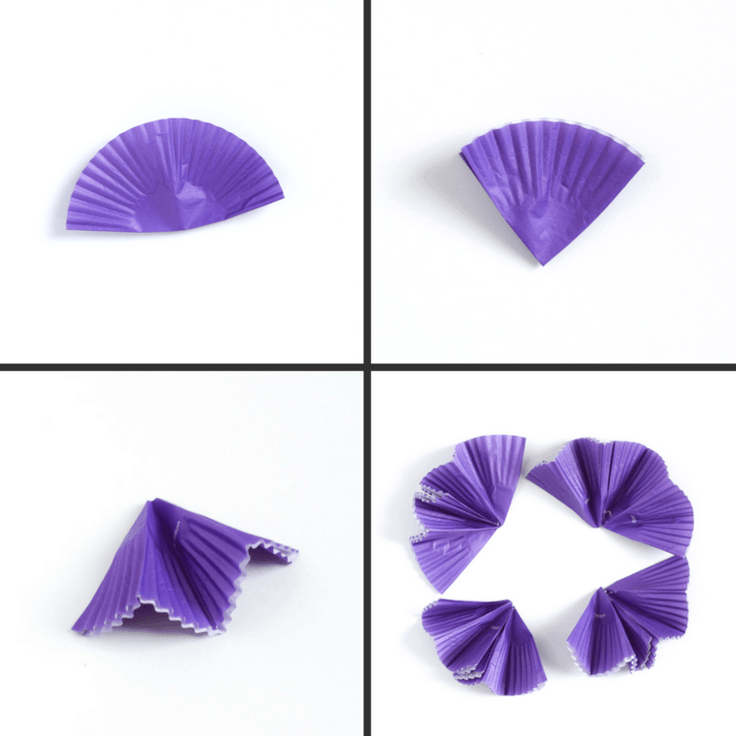 Here are a few more cupcake liners crafts you might enjoy!